Best Cheap Hotels Venice Italy - Possible to Sleep Cheap...! It's Possible to visit Venice and Sleep Cheap...! Trying to find cheap hotels Venice Italy? It sounds like an impossible task for many of you. And you are right? Right... The Italian city of Venice is one of the most expensive cities in Europe. They mention Venice often when it comes to high costs hotels. Admittedly, it's possible to visit Venice and sleep cheap...! Yes, you just got to prepare well. And I will show you how! Location of the hotel is for me essential for cheap hotels Venice Italy. Hotel Lisbona enjoys the privilege of a central location. Near the main tourist attractions, monuments and landmarks are within easy reach. Staying here was convenient and I had a room at a very low rate. Another option is to find hotels outside of Venice. It could ultimately save money considerably. Preferable on the island of Lido. Let's see if there are still available rooms for a cheap sleep. Another option is to sleep in a hostel. A nice hostel is an excellent alternative to an expensive hotel. Most hostels also have double rooms with private bathrooms, and so you do not have to compromise on privacy. Hostels in Venice often have a central location, and you can use a kitchen where you can prepare your breakfast, lunch or dinner. Especially in a large, expensive city that is a godsend. Hostels are also increasingly nicely dressed and equipped with good beds. For the most extensive and most complete selection, you can take a look at Hostelworld.com. And have you ever heard of a 'poshtel'? These are luxury hostels with a strong focus on design and experience, but where you can sleep for a reasonable price. A good example is the hip Generator Hostel in Venice. When I am planning a trip and am looking for accommodation in Venice, I always use the Booking.com website. The site itself is well-organized, so you immediately see which hotel best suits your needs and budget. The significant advantage of Booking.com is, in my opinion, the smooth cancellation policy. Almost always you can cancel until a few days before arrival, which is very useful if you have made other travel plans or have found cheaper accommodation in the meantime. You often only pay on location, so cancellation is also indeed canceled. Booking.com also works with a loyalty program: Genius. If you make more than seven bookings in a year, you are automatically a Genius member and receive a 10 percent discount on selected hotels. Sometimes Genius members also receive extras such as free Wi-Fi or free rental bikes. And that is easily earned. My first time in Venice, I went looking for a cheap hotel in Venice. Ultimately it comes down to compare the price and quality of the hotel. A clean hotel is for me significant. You can leave your review about a hotel in Venice on my site Hotel Review Page > My reviews and advice are independent. You need a good overview, and I try to give you enough information to make a good choice. It is crucial that you know how much money you spend per night. And hotel prices are depending on the period when you travel. In high season (May-Sept) the hotels are more expensive. And during the Carnival period (Jan-Feb) hotel owners are raising prices immediately. Go in a period when it's low season in Venice. I think in all periods of the year Venice is lovely with its charm. Maybe you can enjoy even better since there is less tourism in Venice. 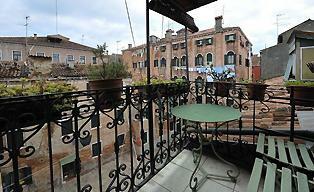 By finding cheap hotels Venice Italy you can also make good use of special offers. Think about last minute deals or deals where you will get the third night for free. These special offers can save money and is making your stay in Venice much cheaper. ...How to Spend my Day Cheap in Venice? Do not buy a bottle of water or soda directly at the main tourist attractions, including the Rialto Bridge and St. Mark's Square. Sometimes it saves 1 EURO if you go a couple of streets away to buy a bottle. 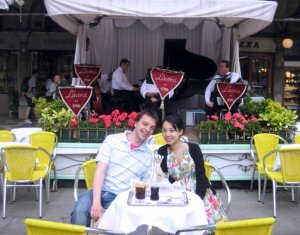 Another tip to have a second Venice experience is to choose the right restaurants. Sure you can pay for quality (see my tips' Venice Restaurants), but around the main landmarks, restaurants are more expensive. And the quality is mostly tourist menus with easy pasta, everyday pizzas and more. You have read about how I suggest finding cheap hotels in Venice Italy. Please click on the links to explore my site more and get information about the different topics.